I went for a long ride (approximately 15 miles) on Raudi this morning. I got up early because Pete did the same. 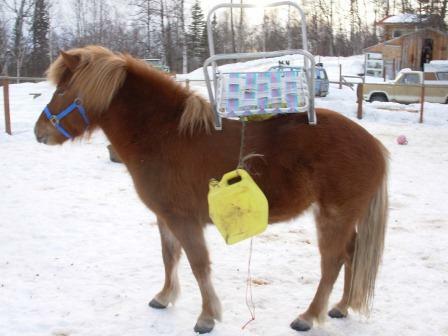 He had to take our neighbor Jim to the Talkeetna Clinic for a dental emergency. So I got up when he did, and was saddled up and ready to go by 8:45 a.m. My thinking in getting going early was that the weekend partiers that inhabit the Upper Buffalo Mine Road area would soon be back at work. Turns out that I was right. I didn’t see any ATV traffic and was passed by just one car. In this respect it was an all-around pleasant ride. what I call the Murphy Road-Ridge Runner cut off trail. We then headed down the Moose Creek camping area, and took a close look at Moose Creek. It was (I deduced) low enough for mature horses like Tinni and Raudi to cross, but too high for immature horses like Hrimmi to cross. On we went, up Buffalo Mine Road, the surface of which changed from pavement to dirt. We ambled up the gentle grade Raudi being less than enthusiastic about this idea. She bobbled some at the trot and repeatedly tried to turn back in the direction of home. The word that best describes her attitude is “pissy.” It became a war of wills, with me repeatedly using my crop to keep her going. Between rounds, I considered all the things that might be wrong, first focusing on the physical issues, poor saddle fit, leg soreness, tooth problems, and spinal misalignment included. I then considered mental issues. The one that stayed in the forefront of my consciousness was related to memory. Four years ago, on the very same ride, Raudi and I had a bear encounter. Would Raudi have remembered this? Well, it’s been said that horses have amazing long term memories. At the same time, Raudi acted as if there were untold creatures in the bushes, and all wanted to attack her. We finally reached the road’s end, and then turned around. It was then that both Raudi and my attitude changed for the better. Raudi immediately stopped fighting and being resistant. And I relaxed and focused on my use of good equitation techniques, breathing, stretching down my heels, and looking up included. We set out at a nice clip—and when I asked trot, I got trot. We continued on to the Four Corners Loop, mainly moving at a walk. And once we got back to Murphy Road, I dismounted and walked Raudi the final mile home. Looking at us, an observer would think that we were a perfect match since (quite obviously) we appeared so companionable. And at that moment, we were companionable. If the observer and I talked, I would have said that more often than not, this horse and I get along. But then there are those (now) rare times when we don’t. I know in general how the mind of the horse works. But I don’t know how Raudi’s mind works. She is a very complicated individual who likes to have things her way. This is something I can say for sure. So I do the best I can by being diligent and consistent. Sometimes, this does seem to pay off.